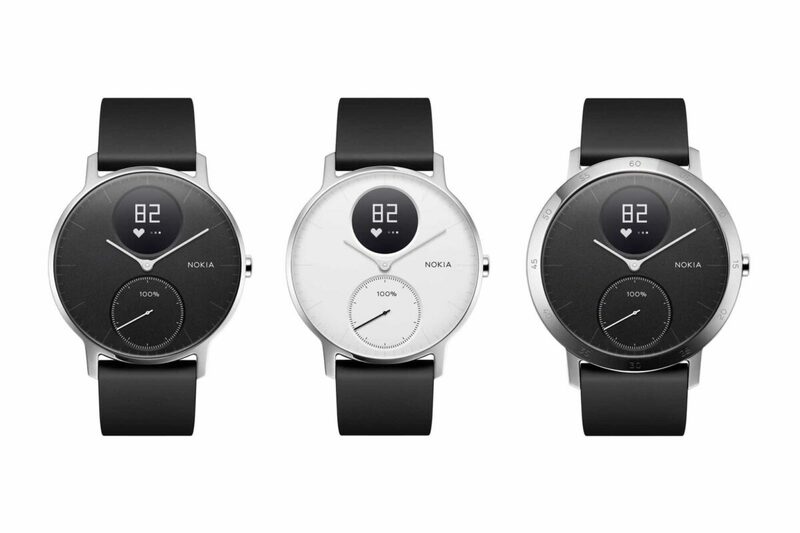 The purchase of Withings, the French based health device making company earlier this year by Nokia showed its interest to venture into health smartwatch market. The new Nokia Steel watch HR smart watch has already won the CES 2017 Innovation Award in Biotech, Fitness and Sports section. If you want a fashionable as well as a health monitoring smart watch, then this is the watch for you. The new Nokia Steel watch comes with a beautiful looking French design, stainless steel covering, 36mm case and a bigger 40mm size; both model which are available in black and white colours, having both a 18mm and 20mm strap and chrome hands. This makes it fashionable health monitoring device. The display features two sub-dials, an upper digital display that shows the percentage of daily personal goals set in the Health Mate app that is achieved while the lower analogue display shows the time. A multi-functional button is also present on the side which helps the user to navigate the display to show data like distance traveled, daily steps, sleep duration, alarm and calories burned amongst other things. It connects with the Nokia’s Health Mate app to monitor daily activity giving concise information on events such as Heart rates, energy expenditure, distance travelled amongst other things. The Health Mate app allows you to interact with friends with its in-app leaderboard interaction, challenge friends, data sharing between users and communication through social media platforms. It also gives personalised advice, food logging capabilities, daily timeline and summarising heart activity. Nokia Steel HR smart watch also offers activity tracking feature which automatically detects different activities alongside various movements and speed in this activities. It is equipped with a modern day automatic activity recognition function for swimming, walking, running and other range of activities analyzing distance covered, number of steps taken, duration of the activity session and calories burned through the Health Mate app, which connects with other apps like Google Fit for data tracking, the likes of RunKeeper and Nike+ for running tracking and MyFitness to measure the amount of calories used. This is due to the fact that the Health Mate app does not have all these features. The watch is also water resistant and recognises if the user is in water or swimming. It analyzes sleep patterns, sleep cycles and the time you usually wake. This includes the amount of time you spent in bed, the time it took before you could sleep, the number of times you woke up. In this way, the smartwatch helps you sleep better and avoid messing up your sleep time which is crucial for to having a good rest time. The app also acknowledges certain milestones and how far you have achieved your set fitness goals. Another commendable attribute is its long lasting battery that lasts for 25 days before switching to the power save mode which lasts for another 20 days and continues tracking essential activities. This new watch is both a classic, sleek and handy health monitoring device serving as both a fitness and fashionable, smart watch.